Hilton Shillim Estate Retreat & Spa is built amidst the magnificent landscape of the Western Ghats, offering a sanctuary for the body, mind and spirit. Featured among the most comprehensive spa facilities in Asia, this retreat is located in close proximity to Mumbai and Pune. The property also provides an inspiring backdrop for exclusive corporate retreats and social gatherings. Rated as the ‘Best Luxury Resort in Asia’, Hilton Shillim retreat offers lavish forest and valley view rooms and suites, culinary fare and a range of recreational facilities and services. To meet eclectic range of dining options, there are seven restaurants offering cuisines made from primarily organic and locally sourced ingredients. Designing and master planning of this retreat has been done by Steven Harris Architects and Taller de Arquitectura Arcadia, landscape designing has been done by Margie Ruddick. 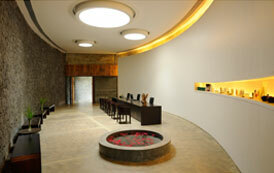 Interiors of this 100-room spa resort have been done by Khanna Schultz. They have developed the interiors using an ecological sourcing philosophy, focusing on materials and techniques native to India. Strong architectural forms and varied roof lines of the buildings have been accented, allowing the guests to focus on the rich landscape of the valley. An atmosphere of calm prevails in the resort, with harmonious selections of local and regional materials. 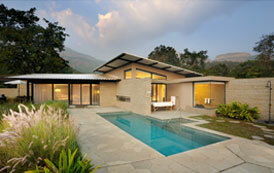 The Shillim SPA has been rated as the ‘Best Luxury Spa Resort’ in India in the Business Destinations Travel Awards 2013. The retreat also has the distinction of being acknowledged among the top 5 new luxury resorts in India in the Condé Nast Traveller Readers’ Choice Awards 2013 and the World Luxury SPA Awards as the “Best Luxury emerging spa in 2014” and “Best Luxury Wellness SPA in Asia 2014”. The retreat was also awarded as the “Best Scenic Environment in 2014” by World Luxury Hotel Awards and won a “Wellness travel award in 2014” by Spa Finder. 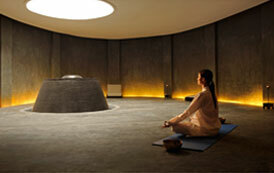 An extravagantly minimalist retreat that attracts seclusion seekers as well as legions of Hilton Hotels.